If we leave the trampoline in the sun, it will dry off in a couple of hours. However, sometimes, we would like to speed up the natural process and do it faster. Sadly, from time to time, we need to clean our trampolines, which usually includes water and some soap. Still, although that seems simple, it’s not easy to dry a trampoline after washing it. When we finish cleaning the trampoline, we can remove some of the water with towels that need to be dry and clean. Afterward, we can leave it in the sun — which is one of the best ways to dry off a trampoline. Nevertheless, when we decide to do this, we also need to check the weather forecast. It’s not quite sensible to do it on a rainy day since it would be more difficult to dry it in humid weather. On the other hand, we should try not to get wet when removing the water with a towel. One of the ways of avoiding this is to go underneath it and push up the middle of the trampoline. 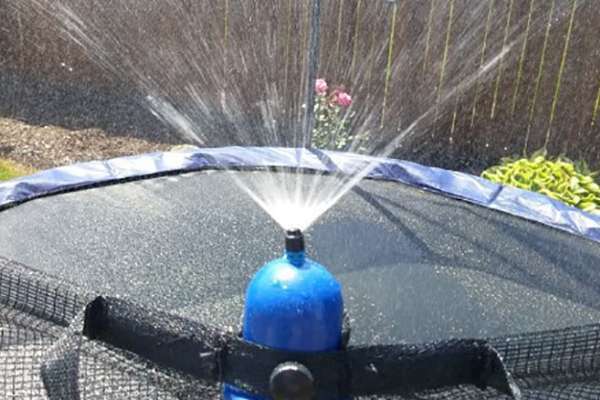 The extra water will come off it, and that is how we can get a dry trampoline fast. Another handy tip: Clean it during the warmest part of the day — 12 to 4 PM. That is a great way to speed up the drying process. Winter is coming — although we cannot wait for the new season of Game of Thrones, this also refers to keeping the trampolines protected during the cold and damp months. Even though trampolines are usually made of durable and rust-resistant materials, it is smart to take extra care of them during winter and autumn. 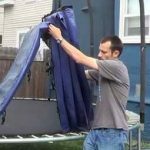 When we are trying to store a trampoline, it is best to disassemble it and keep it in a garage — and that’s how we get an always dry trampoline. It would be even better if we have the original packaging. Before we put away the mat, we should wrap a few dry sheets around it. Also, we should not leave the metal parts wet for a long time. Instead, we should make sure to wipe them with a clean and dry cloth. On the other hand, we can take off only the frame pads and leave the mat outside. There’s no need to worry about rain since it will go through the mat. However, if there is a lot of snow, we should take it off before it affects the springs. Also, there is a possibility of using a cover, which will actually function as a water-drainer. In fact, it will allow the water to go through the mesh so that it doesn’t stay on the surface. However, beware of the covers that just retain the rain and snow since they can damage the frame. Is it Bad to Jump on a Trampoline When it’s Wet? We know that jumping on a wet trampoline seems to be fun, but it can be risky too. Therefore, we should not use a trampoline as soon as we get out of the pool! First of all, it's much more difficult to use them when they are wet since they are too slippery, so it is better to wait. It gets even more dangerous if there is more than one jumper! Some even say that we could jump higher on a wet trampoline, but we think that it is not worth a risk. Moreover, it is especially difficult to keep the kids off the trampolines after the rain. It might not be a bad idea to get a safety net if we cannot follow them around the whole day. Also, there is a concern that we can damage the trampoline if we are using it when it is wet. Word of advice: It’s better to dry off a trampoline than to injure ourselves while using it. If we break something, we won’t be able to use it for a long time — and we certainly don’t want that! We should keep the trampoline dry since that means there is a smaller chance that someone will get hurt. However, if we are in a rush, there are ways of getting the trampoline to dry quickly. 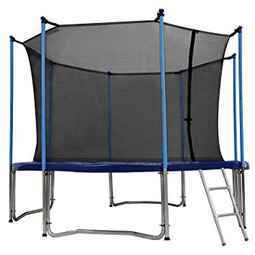 In any case, if we take care of our trampoline, we will be able to use it for a long time and have a lot of fun! If you like the article, share it and comment below!